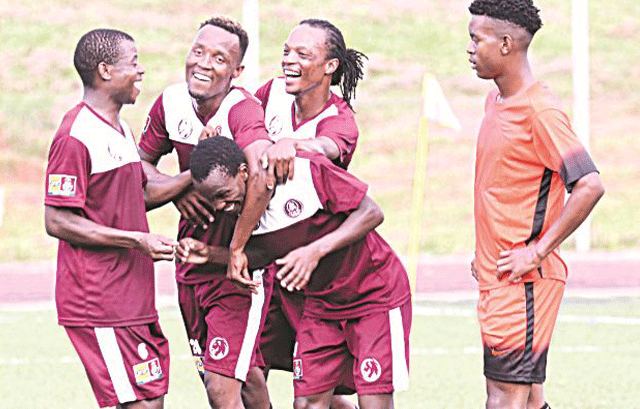 SOCCER – MANZINI Wanderers displayed a five-star performance to see off a disjointed Mbabane City and book a place in the last 16 of the 2019 Eswatini Bank Cup. The three-times runners-up outclassed the National First Division outfit with a 5-0 beating during a one-sided affair played at the Somhlolo National Stadium yesterday. The ‘Weslians’ were a thorn in the flesh of the capital city side as they were three goals up within the opening 15 minutes of the third game of grand opening affair witnessed by over 3 000 fans. Wanderers showed their intention as early as the third minute when they were awarded a spot kick after their South African winger John Pako was brought down inside the box by defender Ndumiso Dladla. Former Mbabane City playmaker Mancoba ‘Spider’ Maseko made no mistake to give Wanderers a deserved lead by sending City goalkeeper Mlungisi Mamba the wrong direction. The ‘Weslians’ were in cloud nine two minutes later after Ghanaian striker Johnson Mensah made it 2-0 with a sublime header provided by a Mancoba Maseko corner. Wanderers recent signing John Pako then registered his name on the scorers chart just before the first quarter with a low shot which deflected on the opposition defender Mayibongwe Mlipha. Seasoned midfielder Sicelo ‘Junior’ Simelane ensured a healthy lead for his side before the breather as he netted the fourth goal of the contest in the 37th minute after meeting a Njabulo Magongo pass inside the box. The second half saw little action from both sides after Wanderers wrapped up the contest in the opening half. The two coaches Thabo ‘Koki’ Vilakati and Linda Msibi made some few changes that did not make much impact for prolonged stages of the second stanza. Wanderers brought in Mfanafuthi ‘Taribo’ Bhembe and Mpendulo Ngidi for Johnson Mensah and Mancoba Maseko, respectively, while Mbabane City brought in Meshack Lushaba for Bonkhe Motsa. Wanderers eventually sealed their party three minutes before fulltime through a clinical strike from Njabulo Magongo which came from a Jose Machado low cross.